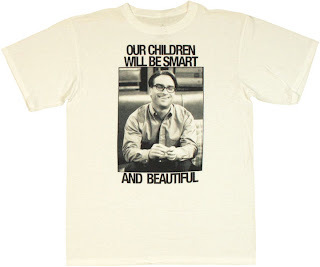 "Our BABIES will be smart and beautiful"
There is a new, officially licensed, Leonard t-shirt. Considering that Leonard is my favorite character, and he rarely gets enough love, I would normally be thrilled. And buy it immediately. But the quote is wrong. As Leonard says in the Pilot, "Our babies will be smart and beautiful." And even when Raj brings it up again in season four, he says, "Do 'our babies will be smart and beautiful'. That one always makes me laugh." But the shirt says "children." Maybe I'm being picky. Maybe I should just be glad there's another Leonard shirt. But I really wish the quote was correct. So far I only see it for sale on Stylin Online's website - and they do have a link where you can "ask a question about this item," so I've asked if they can fix the quote. It's a long shot, but worth a try!